Money Tree. 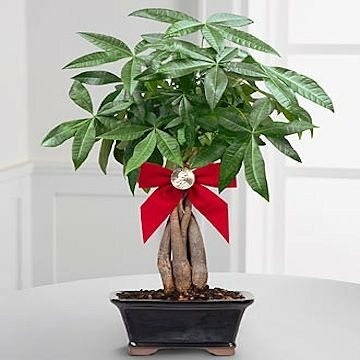 Money Tree (Pachira aquatica) - The Peace & Prosperity Braided Money Tree will send wishes for good fortune and positive outcomes to your special recipient. This lush tree has been growing for 4 years with a beautiful braided trunk to grant luck and serenity with its exceptional style. Arriving planted in a square ceramic container and tied with a red bow displaying a lucky Sacagawea Dollar coin, this gift is one they will enjoy for years to come!